In Playa del Carmen, there are two high-speed ferries that shuttle people back and forth to and from Cozumel all day long. They run every hour, so you never have to wait long. The ferry pier is located in downtown Playa del Carmen, so if you're coming over from Cozumel, you can just walk from the pier - no additional transport needed. If you're staying in a Playacar hotel, the ferry pier is also within walking distance. The ride takes about 45 minutes with the regular ferry, or Ultramar has a new luxury ferry that can cross in only 20 minutes depending on weather conditions that makes traveling back and forth between Cozumel and Playa del Carmen a snap. This is especially helpful for Cozumel cruise passengers on a tight schedule looking for cruise excursions to the many attractions on the mainland of the Riviera Maya such as Mayan Ruins sites. or 20 minutes on Ultramar's new luxury ferry. Ferries run 365 days a year, weather permitting. Prices and Schedules are Subject to Change Without Notice. Check with the ferry company (see right) to make sure. We recommend to check the day before you'll go on the ferry. WHERE IS THE PLAYA DEL CARMEN FERRY TERMINAL? Location: The ferry terminal is located right in downtown Playa del Carmen, about a block and a half from the main square and Plaza Playacar, where most of the tour pickups take place. See the map at right. Mainland Hotel Guests: We recommend taking a taxi to the hotel pier unless you're staying downtown, within walking distance to the pier. It takes about an hour from Cancun, 30 minutes from Puerto Morelos, 15 minutes from Puerto Aventuras, and 25 minutes from Akumal. Calica Cruise Passengers: Take a taxi from the Calica cruise pier. It only takes about 8-10 minutes, and costs about $8.00 USD. Parking: There are two street level parking lots and an underground parking garage within a short walk of the ferry pier. Learn More. WHERE IS THE COZUMEL FERRY? 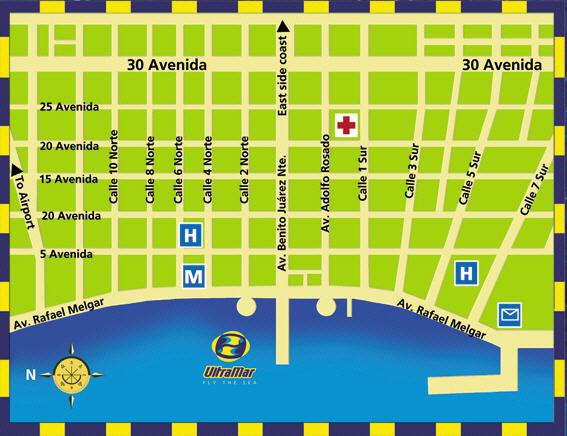 Location: The ferry terminal is located right in downtown Cozumel, at the extension of Av. Lic. Benito Juarez, across from Palmeras Restaurant. 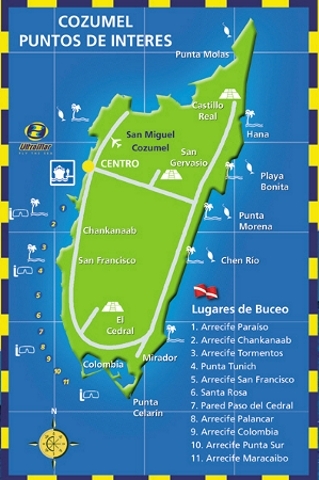 Cozumel Hotel Guests: You can walk there from anywhere in San Miguel (downtown). From areas outside of town, you'll just take a taxi from your hotel or where ever you happen to be on the island. Taxis are readily available all over Cozumel. Very easy. Cruise Passengers: A taxi to the ferry pier from the Puerta Maya or International Pier should cost about $6.00 USD and take about 7 minutes. If your cruise ship is arriving at Punta Langosta, then you can just walk about 5 minutes down the road to the ferry (roughly 6 blocks). Parking: In Cozumel, street parking near the ferry pier is typically available on the main road, and there is a parking garage at MEGA to the north and at Punta Langosta cruise pier about 5 blocks to the south. Easiest is to take a taxi. Still have questions? Just contact us and we'll get you going.